Discussion in 'Politics & World News' started by valve bouncer, Sep 3, 2005. Saw this on another web-site. Gave me a chuckle. 1)Contract all reconstruction work to large British corporations- and be prepared to pay billions in unidentifiable "expenses"
2) Payback said loan over 50 years with extortionate interest. 3) Allow privatisation to British firms of everything in America. 4) Must become a democracy, beginning with an immediate regime change bringing in a pro UK president (preferably a puppet regime run from Westminster), giving big trade favours to the UK. 5) Must prove themselves willing to aid the UK in the "War on Terror". 6) Must allow British "forward operation posts to be built around the country. 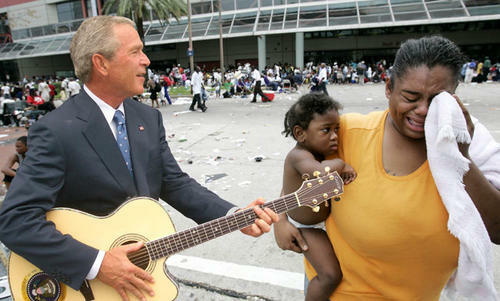 He really should quit his day job... he looks comfortable with poor people. i know this was a tongue in cheek thread, however its not entirely without merit. where IS the rest of the world when calamity strikes here? as much as we've given in foreign aid over the years where is the quo part of the quid pro? Well thicky, even a rudimentary googling (try "Katrina foreign aid US"- gives you pages and pages of stories) reveals dozens and dozens of countries that have offered aid. Even Cuba and Venezeula are offering aid. Quite apart from this is the fact that your State Dept has not officially requested aid. It helps if you know what you're talking about before you post. We don't need no stinking aid - thats for poor countries. The oil-rich nation of Qatar has offered the United States $100 million to assist in the humanitarian crisis triggered by Hurricane Katrina. The state-run Qatar News Agency said Saturday that Qatar's emir, Sheikh Hamad bin Khalifa al-Thani, decided to contribute that amount for relief "and humanitarian supplies for the victims of this disaster." The U.S. government has received offers of support from dozens of nations across the globe. Australia, Austria, Armenia, Azerbaijan, Bahamas, Belgium, Canada, China, Columbia, Cuba, Dominica, Dominican Republic, Ecuador, El Salvador, France, Germany, Guatemala, Greece, Guyana, Honduras, Hungary, Iceland, India, Indonesia, Israel, Italy, Jamaica, Japan, Jordan, Lithuania, Luxembourg, Mexico, the Netherlands, New Zealand, Norway, Paraguay, Philippines, Portugal, South Korea, Russia, Saudi Arabia, Singapore, Slovakia, Spain, Sri Lanka, Switzerland, Sweden, Taiwan, Thailand, Turkey, United Kingdom, the United Arab Emirates, and Venezuela. International organizations also offered help ranging from medical teams to tents to cash donations. They include NATO, the Organization of American States, the U.N. High Commissioner for Refugees, and the World Health Organization. Or maybe just opening your eyes. The oil-rich Persian Gulf state of Kuwait (search) said Sunday it will donate $500 million in aid to U.S. relief efforts after Hurricane Katrina. Or alternatively you could have just admitted you were wrong and had no idea what you were talking about. Pretty much goes for all your posts though. I think I'll start calling you N8 lite.